1988-01-02. New. Ships with Tracking Number! INTERNATIONAL WORLDWIDE Shipping available. Buy with confidence, excellent customer service! 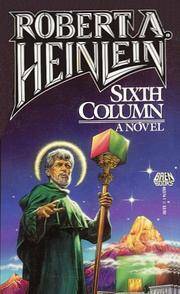 Sixth Column, also known under the title The Day After Tomorrow, is a science fiction novel by Robert A. Heinlein, based on a story by editor John W. Campbell, and set in a United States that has been conquered by the PanAsians, a combination of Chinese and Japanese. Originally published as a serial in Astounding Science Fiction (January, February, March 1941, as by Anson MacDonald) it was published in hardcover in 1949.